Looking to make a quick sale of my Willson 2900. The horn was purchased in October 2016 and received by myself in February 2017. 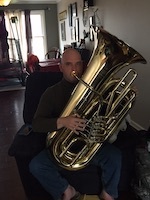 It’s been through the last three semesters of my undergrad in Euphonium Performance and I’m looking to sell to get into a different brand. No dings or dents. Buyer pays shipping. Located in Central Florida area between Orlando and Tampa. Comes with a Willson 6 1/2 AL and Denis Wick SM4MX mouthpiece in gold plating and a hard case. More pictures on request! Talk to me about a deal! Last edited by jmcniven on Fri Aug 10, 2018 12:01 pm, edited 1 time in total. Located in Central Florida between Orlando and Tampa. Updated in the post. Thanks! Bumping my post. I have a week to sell this horn!